This intriguing, futuristic thriller conceives of a terrifying future for the United States. 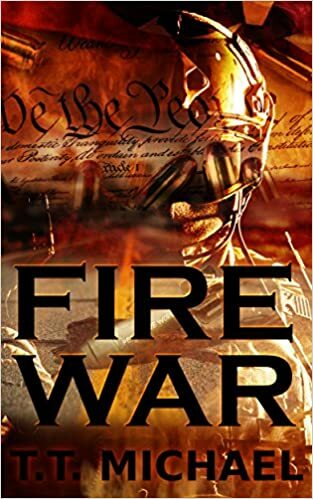 In his thought-provoking book Fire War, T. T. Michael creates a country where the highest office is no longer elected by the populace and there is no longer unemployment—where the only real fear is of the terrorist group Hariq Jihad (Fire War). Gunnery Sergeant Anthony Jackson is charged with protecting the president of the United Continental States of America (UCSA). As Jackson comes to the realization that not everyone is happy with the current situation in the country, everything he holds dear is imperiled. What will happen to the country, and Jackson, if the concepts of personal liberty and the safety of the country cannot be balanced? Michael’s futuristic political thriller has a chilling ring of truth to it. As current events unfold, comparing Michael’s fiction with today’s reality sometimes becomes overwhelming. Michael describes a world where personal liberties and individual rights have vanished for the good of the group. No one has a say in who runs the country or what decisions are made by the president, a man that everyone trusts…but should they? Anthony Jackson is an interesting protagonist. He is a rule-following, hard-charging marine who clearly loves his family and country. He takes his position guarding the president very seriously, yet he seems to ignore some of the signs of impending trouble that one would expect a razor-sharp military man to catch. This seems to be Michael’s way of creating a Greek tragedy format: the chorus singing warnings in the background, with the fallible hero ignoring them until it is almost too late. Jackson’s struggles with his daughters, particularly Maya and her “radical” ideas of personal freedoms, feel real. Even into this future, teens are still testing limits and putting their parents in difficult situations. Jackson’s everyday family life adds significantly to the tension of the story by making us know about and care for the people he is most interested in protecting…after the president, of course. Thriller fans will find this book intriguing and, to some extent, terrifying in its plausible predictions for our future in the United States.